Founded in 1896 as the Kennebunkport Golf Club, Cape Arundel Golf Club was created by summer residents and golf enthusiasts who wanted to bring their love of the game home. At its founding, Cape Arundel was one of just 74 golf clubs in the United States. By the early twenties it was apparent that the original course had outlived its usefulness. In an effort to create a course that provided not only enjoyment for the regulars, but also a challenge to golfers with any skill level, it was decided that a new course was in order. The architectural skills of U.S. and British Amateur Champion, Walter J. Travis, were secured to produce the new links style layout. Every hole was planned carefully by Travis and promised to provide first class golf, beauty and difficulty. From the natural hazards and beautifully contoured greens to the perfectly placed bunkers and strategic layout, the new course demanded the finest kind of golf. 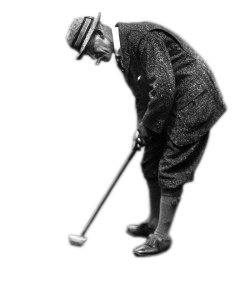 Travis, known as “The Old Man”, was the most successful amateur golfer in the United States in the early 1900’s. Trips to Great Britain as part of his golfing career led him to course design, and he is believed to have had a hand in designing, remodeling or consulting on more than 50 golf courses. In addition to Cape Arundel, notable courses that bear the Travis influence include Pine Valley, Pinehurst #2, National Golf Links, Garden City Country Club and Westchester Country Club. In 2009, Cape Arundel Golf Club was named to the National Register of Historic Places by the United States Department of the Interior. This listing indicates that the course and property are considered worthy of preservation and protection as part of America’s cultural heritage. First constructed in 1900, Cape Arundel Golf Club’s historic hunter green clubhouse overlooking the Kennebunk River was renamed as 41 House in 2011 to honor the club’s most famous member and 41st President of the United States George H.W. Bush. Cape Arundel Golf Club is proud to have President Bush as an Honorary Member, along with Honorary Members President George W. Bush and The Honorable Brent Scowcroft, KBE. The Walker Cup, contested biennially and organized by the R&A and the United States Golf Association, is named in honor of George Herbert Walker, lifelong member of Cape Arundel, President of the Club from 1949 – 1954, and President of the USGA. The Walker Cup Trophy was proudly displayed at Cape Arundel during the summer of 2009, on loan from the USGA. Four Presidents of the United States have played Cape Arundel: Nixon, Bush, Clinton, and Bush. Other notable individuals and golfers have also enjoyed the Club, including Babe Ruth, Francis Ouimet, Arnold Palmer, Charles Lindbergh, Dottie Pepper, Rod Laver, Fred Couples, Jane Blalock, Davis Love, Justin Leonard, Phil Mickelson, Sandra Haynie, David Toms, Greg Norman, Doug Sanders, Brad Faxon, Prince Andrew, Ben Crenshaw, Hale Irwin, and Jose-Maria Olazabal. The course record, a 60, was recorded on October 2, 2006 by Mickelson. Cape Arundel Golf Club is a member of the Walter J. Travis Society and the United States Golf Association.